Cocomo products from the House of Nature, are traditionally inspired, safe and toxin free. These natural & nourishing products have been formulated by a leading cosmetologist and our circle of moms for happy, healthy & confident kids. Cocomo Earth Shine Shampoo & Conditioner is a gentle & nourishing emollient that cleanses the hair effectively with added moisture, removes dirt and oil while maintaining the PH balance of the scalp. The natural conditioning of Coconut & Olive oil, antioxidant rich Neem & Tea Tree and nourishing Aloe Vera, Cocomo shampoo makes the hair squeaky clean. About the Brand: Cocomo from House of Nature is home to a happy range of cleansers and lotions, hand-crafted for children aged 5 and up. Created by a circle of moms and an expert cosmetologist, their natural products are formulated using only the highest quality ingredients. They are a safe haven of goodness enriched with nature's best. Explore the entire range of Bath Time available on Nykaa. 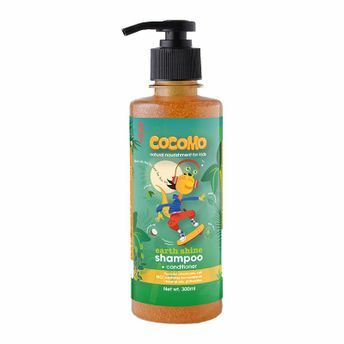 Shop more Cocomo products here.You can browse through the complete world of Cocomo Bath Time .